These baskets were come from the Seri people. The Seri live along the desert coast of the Sea of Cortez and call themselves Comcaac. 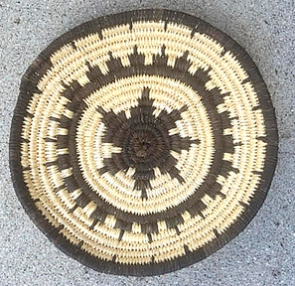 Seri baskets or hataal are woven of haat or torote (limberbush/jatropha cuneata). Occasionally they use a red dye from the bark of the white ratany plant (heepol/Krameria grey). The black is generally an aniline dye. Currently living close to Mescalero Apache country Terri wove this of available materials, so in addition to willow for the coil and the seed pod of the devilsclaw plant for the black, she used 'white root' for the lighter color. It comes from a grass-like plant that grows along the Rio Grande, and which is no more than knee-high but has sturdy light-colored roots that she collects and prepares. 13.25 inches across and about 1.25 inches deep. $1275. The one at right depicts a Gaan Dancer - also known as a Mountain Spirit Dancer. 11 inches across and about 2 inches deep. $975. The basket directly above is by Aurelia Molina. 14 inches across and 4 coils per inch. $400. A very unique design. This basket was woven by Patricia Martínez and shows the cardon cactus, a Seri man and woman and their dogs. 5 inches high and 5.75 across. $100. Her work can be found in the collection of the Arizona State Museum. 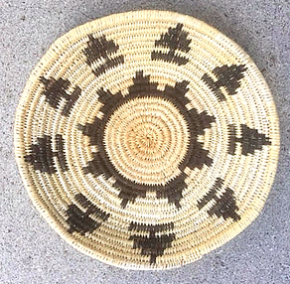 Terri Goode, of the San Carlos Apache Reservation, has been making baskets for over 25 years, having learned from her mother and her grandmother, Adella Telto, a member of Geronimo’s band that was sent to Ft Sill, Oklahoma. Teri made her first coiled basket when she was 10 years old under her grandmother’s guidance. Her grandmother showed her what types of material are needed for both burden baskets and coil baskets.